The Airspeed Unreliable scenarios is one of the more challenging non normals faced by pilots in the simulator. Of the many serious malfunctions I’ve witnessed crew deal with in the simulator – this one more than any other has caught crew out to the point of a serious limitation exeedence (high/low airspeed) or potentially an airframe loss. In the real world, this failure has killed people in the past, with the Air Peru B757 accident being the most common one that comes to mind. 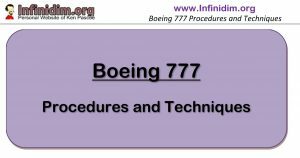 However accident and incident statistics are replete with this outlier failure that has recently become a major focus of the world’s airline training systems, most especially after the loss of Air France 447 in the Atlantic. While the Air France and Air Peru events were clearly accidents of the first order with significant loss of life – unreliable flight instruments malfunctions have cause significant loss of control incidents that were eventually recovered. The following text is taken from another incident report, where a fully functioning set of co-pilot (and presumeably standby instruments) remained available to both crew. In spite of this the aircraft suffered signficant deviations of flight path owing to a combination of the autoflight and pilot inputs. At 2203 the captain’s airspeed indicator increased from 276 to 320 knots and the captains altimeter increased 450 feet in approximately 5 seconds. To re-capture altitude, the autopilot commanded pitch down approximately 2 degrees. An overspeed warning activated whereupon the captain retarded the throttles to idle. The autothrottles disconnected automatically but the autopilot remained engaged. The autopilot pitched down another 2 degrees before pitching up approximately 8 degrees. The overspeed warning remained on for about 41 seconds. The captain disengaged the autopilot and manually initiated a climb. Thrust remained at idle and the captains airspeed indicator decreased to 297 knots. The captain increased pitch to 12 degrees nose up, his airspeed indicator rapidly increased to 324 knots producing a second overspeed warning. The aircraft climbed to an altitude of approximately 35,400 feet above sea level (asl), then started to descend. The captain’s indicated airspeed reached a maximum of 339 knots, before decreasing as the aircraft started to descend. The aircraft was descending through 34,700 feet asl with the captain’s airspeed indicator decreasing through 321 knots and the overspeed warning on when the stick shaker activated (a stall warning device that noisily shakes the pilots control column as the stalling angle of attack is neared). The overspeed warning remained on for the next 20 seconds, became intermittent for 26 seconds, then stopped. The stick shaker activated intermittently for about 1 minute and 50 seconds from its initial activation. When the aircraft had descended through approximately 30 000 feet asl with the captains airspeed indicating 278 knots, the captain increased thrust and within 9 seconds the stick shaker stopped. As the aircraft descended through 29,100 feet asl, the captain’s airspeed indicator rapidly decreased from 255 knots to 230 knots and the airspeed fluctuations stopped. The aircraft continued its descent to 27 900 feet. Throughout this event, the first officer’s airspeed indicator displayed information that was not indicative of an overspeed event. 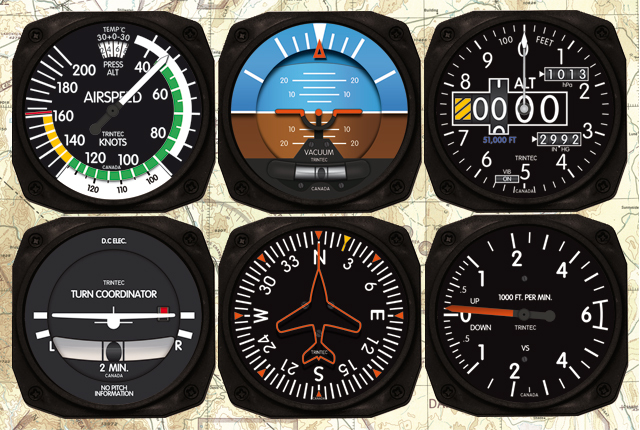 The procedures and techniques that will be required to return the aircraft safely to the ground with erroneous flight instruments, in various weather conditions. This latter point is crucial. While it’s absolutely imperative that such training give crew the skills to recognise this failure and respond appropriately to regain/maintain control of the aircraft – the challenge inherent in returning a modern glass jet aircraft to the ground without functional airspeed/altimeter readings cannot be understimated. Except of course the 787 and the pilots that fly it – where with the flick of a switch airspeed is calculated from angle of attack and is accurate to about 5 knots. B@st@rds. A (previously) unspoken impact on this failure is the effect of a lack of aircrew skills and recency on basic instrument interpretation and maniulative skills. What this means is, pilots who spend most of their time either watching the autopilot fly, or following what the flight director tells them to do are in a poor position when these two marvelous systems are not available. Compounding this are crew who either don’t fly very often, or get little opportunity for manual flight. I myself am a product of what is perhaps the worst combination of the various factors that impact my skills and my recency to perform my most basic task – hand fly the aircraft. While I learnt to fly on conventional instrumentation, I am fundamentally a child of the magenta line. My last 10,000 hours have been in EFIS glass flight deck Airbus/Boeing aircraft that were heavily automated, and typically subjected to airline automation policies that both encouraged the use of the highest levels of automation, and discouraged the practice of manual flight. As a long haul pilot (all sectors 12+ hours, augmented crew) I typically fly perhaps twice a month, which means 4 sectors, two of which (if I’m lucky) where I get to be the handling pilot. If the weather is reasonable and the airspace/traffic conditions conducive, and my partner (and myself) sufficiently alert – I can do some manual flying. Typically I make every attempt to do so, but my experience of flying with and watching other crew fly – I find myself an outlier in this. Much of the flying I see is “200 ft to 200 ft” with the autopilot used to nearly the maximum extent possible. Worse than this, I am a simulator instructor. Hence I fly slightly less than an average line pilot. Offsetting this is the fact that I have (limited) access to this fabulous million dollar toy in which I can practice my craft. Of course, things are never that simple and while our entire regulatory system is built around the concept that the simulator is just like the aircraft, I’ll let you in on a secret – it’s not. Coupled with this is the issue that while the ability to jump into the seat and do a takeoff or a landing to maintain/return legal recency is a simple thing – using the device properly to maintain the complete spectrum of of operational familiarty is not. All this means that I have precious little opportunity to maintain these skills, and practically none to develop them. Current regulatory requirements state I must have done a takeoff and landing in the last 45 days. This takeoff/landing doesn’t have to be on the same flight, and it can be (and is) accomplished in the simulator. Why is the Simulator Different? 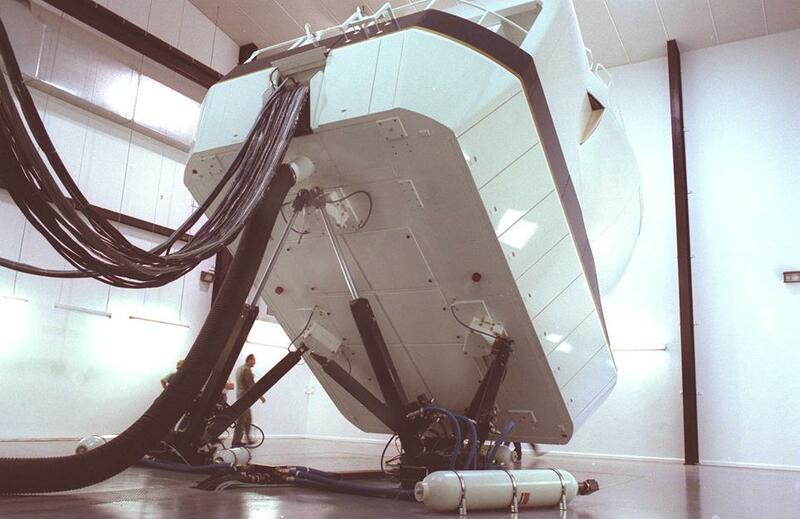 I’ve hinted before that the simulator is not like the aircraft. Which is a strange thing to say, given that this multi million dollar device probably has hundreds of millions of dollars and decades of research making every effort into making it so. Well, from a technical point of view – it’s pretty good. The “feel” is not quite the same, but as a device that serves as a next-best alternative to the aircraft, it does a great job. The problem is in the way we use it. While the simulator functions quite well as a tool to emulate a suitable environment for maneouvre practice – takeoff, landing, engine failure, instrument approaches, missed approaches, etc. – the problem is that while you can be trained to demonstrate technical competency in these maneouvres – it’s pulling them all together in the line operational environment where the “simulation” falls down. Sometimes in the aircraft the most difficult maneouvre to pull off without compromising safety is pushing the aircraft back and starting the engines [OTP]. There are so many people involved in this process that sometimes a Captain is like a traffic cop in the middle of a jam, rather than a manager steering the process while simultaneously mantaining the big picture awarness to safely integrate what must be done with would be nice to see done. Simulators can provide this environment – but the preparation required of the instructors and the training management is extreme. This kind of simulation is called LOFT (Line Orientated Flight Training); or LOS (Line Orientated Simulation) – or when you’re being checked and not trained – LOE (Line Orientated Evaluation). While LOFT/LOS/LOE heavily influenced training thought up to a decade ago, many airlines seem to be back at that point where their training syllabii are driven towards a token half-session LOS/E; combined with multi-repositioning maneouvre training that completes set exercises as dictated by a regulatory matrix. 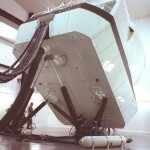 When we step into a simulator perhaps 75% of the available time for training and assessment will be taken up by regulatory based maneouvre requirements. Matrix’s that dictate that each 6 months you must to an engine failure on takeoff in the lowest visibility with the engine failing at close to decision speed, for example. Not only this this simple exercise consume perhaps 20 minutes of simulator time – it dictates the nature of that section of the session – there must be a takeoff, it must be in low visibility, etc. The option of starting the session in mid flight nearing your critical diversion point over the pole goes out the window. After large gaps between flight exposure, the basic manipluative skills of piloting tend to fade slowly, and return quickly to a good level of proficiency with exposure. However after the same abscence, the cognitive skills required to operate safely and efficiently fade quickly and take more exposure to build to previous levels of proficinecy. This second one is crucial. You can throw a pilot into a simulator after 45 days do a few takeoff/landings and be satisfied that as far as that skill goes, that pilot is good to go. But what about the cognitive aspoect. As a member of a small group of highly skilled, highly qualified pilots who seldom touch an aircraft, and have been this way for 8 years now – I can confirm that the least of my worries is takeoff, landing, basic flying. It’s everything else – and most particularly exposure to high workload situations that require practiced cognitive skills that present the greatest challenge to proficiency, efficiency – and safety. To (finally) bring this round to the original heading – if you barely get the chance to practice hand flying the aircraft (while thinking at the same time) – how much harder is it going to be to respond correctly when your instruments are lieing to you? 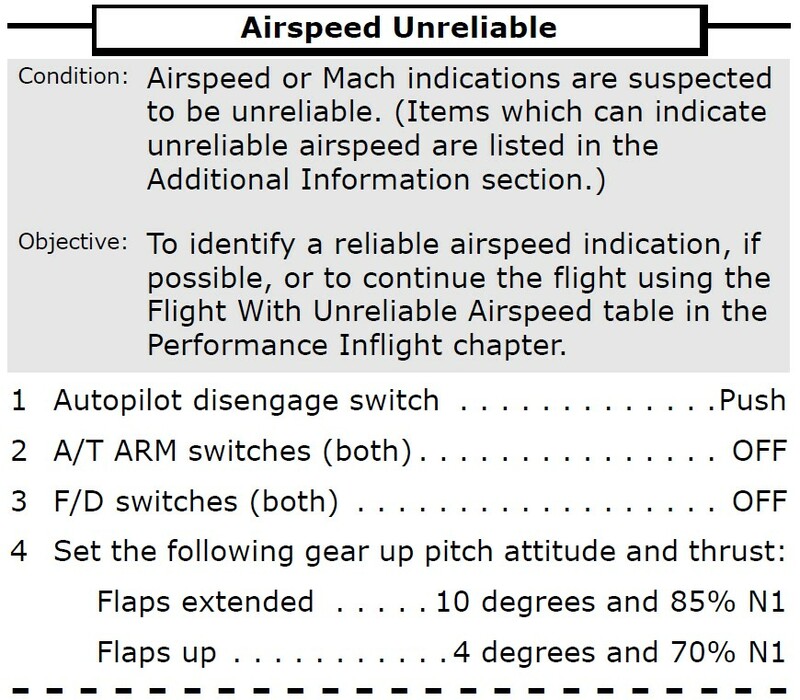 The Airspeed Unreliable checklist was revised in light of Air France AF447 to provide some short term figures for pilots to rely on. The basic intent of this change is to avoid the fixation that often occurs on airspeed and airspeed related alerts during this failure, to the exclusion of sensible pitch attitudes and power settings for existing aircraft configuration. 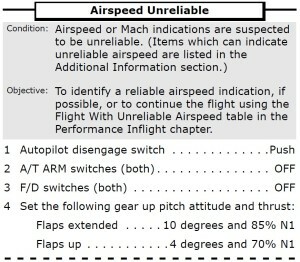 The settings promulgated in the checklist are designed to keep the aircraft in a safe (if not necessarily desirable) state of flight clear of high and low speed extremes for at least as long as it takes the crew to progress through the checklist to that point where they are looking up more appropriate values in the QRH. This may leave the aircraft in a climb or a descent, it may leave the aircraft at innapropriate (but safe) high or low airspeed compared to the normal flight regime. But safe. It’s worth noting that the simulator leaves the Flight Path Angle displayed if selected. However while the FPA, PLI and Stick Shaker are fundamentally attitude based – all take airspeed as an input parameterfor validity checking. Boeing cannot guarantee that any of these will display, or will display correctly in the event of unreliable static/dynamic sources and hence the checklist warns against their use. In the event of a complete static port blockage, some crew have attempted to depressurise the simulator (Outflow Valves – Manual, Fully Open) to use the ASPC pressure sensor to provide an aircraft altitude through the Cabin Altitude display. This technique is technically (systemically) valid and will display an approximate aircraft altitude in a depressurised aircraft. However it has been noted that when most crew takeoff with all static ports blocked (takeoff being the only time this is likely to occur), once crew recognise the malfunction, adopt the promulgated memory pitch attitude and thrust settings and commence the NNM checklist – by the time they achieve level flight in accordance with the QRH, they’re usually over 10,000 ft. Selecting the Outflow Valves open at this point would result in an EICAS  CABIN ALTITUDE, followed by Oxygen Masks and a Rapid Descent – all while on unreliable flight instruments. As such this technique is not recommend by most Training/Standards Departments of the aircraft manufacturer. Using the Cabin Altitude earlier in this failure might indeed give you an altitude to maintain, but without valid power settings/attitudes, you’ll compromise your ability to maintain a safe airspeed until you get into the QRH.